WIN PICK-3/PICK-4/4D WITH THE POWER OF DIVINE GOLDEN BOYS! Always light up an incense stick/ incense cone ( like the one used in aroma therapy) when You are preparing to seek Lottery ( Pick 4 /Pick 3/ Lotto / Toto etc). Lighting up incense cone/stick is to inform the Kumantong (Or other spiritual beings) to stay alert and there is an important official duty to do. When Your Kumantong is seeking Lottery Numbers for the 1st time, You may doubt the power of Your Kumantong and wonder whether the Lottery Prediction will be accurate. "I 1st time ask 4D from Kumantong and Strike Direct 1st Prize!" It can happen and it did happen that just on the 1st time getting 4D Numbers from Kumantong, immediately hit a Direct 1st prize. Some folks hit 2nd Prize / 3rd Prize on the 1st try. Kumantong 4D Prediction usually when hit a prize will be a TOP 3 Prize.
" My Kumantong's 4D Prediction totally miss on the 1st try"
There are folks who seek 4D / Pick 4 from Kumantongs for the 1st time, immediately hit a TOP 3 Prize. Most owners of Kumantongs have to continue seeking 4D Numbers from Kumantong for at least 3 tries before able to see at least 3 out of 4 numbers correct in TOP 3 Prize. Human Beings need time to learn and practice new skills before getting good at it, so do Kumantongs. You should continue to seek 4D Numbers from Kumantong and never give up. You will certainly get to see the high level accuracy of at least 3 out of 4 numbers correct in Lottery Prediction by Your Kumantong at anytime soon. Give your Kumantong continuous, non-stop practicing by continue seeking Lottery Numbers from it on every 4D Draws. Any time soon, You will strike a TOP 3 Prize. "My Kumantong suddenly lose power - don't come close to at least 3 out of 4 numbers correct in TOP 3 Prize for quite awhile... How? What to do?" There will come a time when all the while You either strike small winning in 4D (Top 3 Prize Permutation) or miss by just 1 number on TOP 3 Prize... and then suddenly there is total miss on all of the TOP 3 Prizes, not showing up at least 3 out of 4 numbers correct in any TOP 3 Prizes and it drag from 1 week to 1 month and beyond. 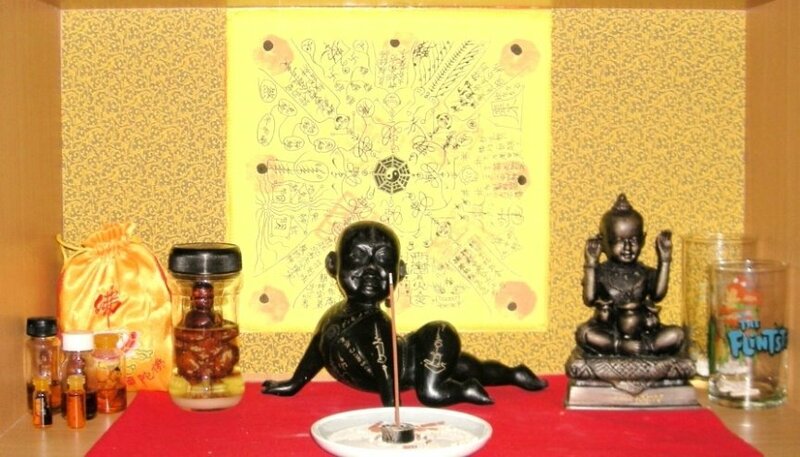 You start to panic.. suspecting that the child spirit, Kumantong, has disappeared from the Statue / Mini oil Bottle / Amulet. Bear it in mind that the Child Spirit will always be there in the Kumantong Statue/ Mini Oil Bottle / Amulet, even if the given 4D Numbers show no sign of at least 3 out of 4 numbers correct in any of the TOP 3 Prizes. Kumantong is testing You on the faith , trust and believe You have on him. You need to "Stay Calm" and "Let It Be", regardless of winning or losing. You just have to persevere and continue seeking Lottery Numbers from them on and on and very soon You will Strike Big Time. Whenever there is a long drought, it will follows by a rainstorm. When there is no sign of at least 3 out of 4 numbers showing on any of the TOP 3 Prizes for quite awhile, it means You will have a Big Time Lottery Strike anytime soon. "My Kumantong 4D Prediction shoot to other Lottery Companies showing in TOP 3 Prize!" 1st Reason - Kumantong purposely play Your backside. Kumantongs are spiritual kids and they can be very playful but they will also give You hints to win 4D while playing with You. It will depend on how alert You are to understand the patterns and hints (usually very straight forward) given by Kumantong to You for Your upcoming next 4D Bet. The hints from Kumantong can be derived from the 4D Prediction and the Actual Results of the TOP 3 Prizes. 2nd Reason - Sometime when the 4D Company You want to bet on is very far away ( Example: Predict Malaysia 4D Numbers from Singapore) , Kumantong will have a hard time detecting the potential winning 4D Numbers. Think of Kumantong as an "antenna" trying to receive radio station few hundred kilometres away. Example: Ask Kumantong for Magnum 4D but the exact numbers hit TOP 3 Prize in Sports Toto 4D. You just have to keep seeking 4D Numbers from Kumantongs and these spiritual kids soon will be very good at it. 1) They are the kindhearted folks in life even before they strike the Lottery. Example: Often give money to the poor and old folks on the street , filial to parents, generous towards friends etc. 2) They immediately have 100% believe in the power of Kumantong when upon setting their eyes 1st time on Kumantong 4D Power and willing to pay money to own it. 3) Folks who are emotionally stable , regardless of whether they strike 4D or not. - Be alert on the numbering patterns between the 4D Prediction given by Kumantong and the actual results. - Keep seeking Lottery Numbers from Kumantongs. Whether it shows only 3 out of 4 numbers correct in TOP 3 Prize or have a long drought, never give up. Just keep seeking 4D Numbers from Kumantong with a peaceful mind (Whether strike or not, just let it be) and very Soon, You will hit very Big Prize. - Kumantongs have their way to test and prepare You to be emotionally ready before letting You strike Big Time. DON'T HESITATE! KEEP A KUMANTONG OR LUP YONG NOW.. I WANT TO KEEP A KUMANTONG NOW! What is Gui-Kia OR Log-Kok?